On our journey to build a better Asia, we at Asia Philanthropy Circle (APC) have been inspired by numerous philanthropists who are willing to take innovative approaches to create systemic social change and to effectively improve the lives of their communities. 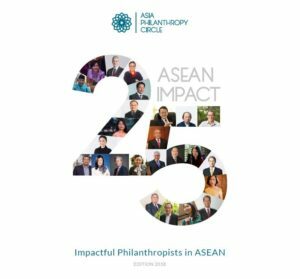 APC has compiled the narratives of 25 such impactful philanthropists from across the region to form ASEAN Impact 25: a catalogue that outlines the overall impact of their efforts, the motivations that drive their philanthropic work and the milestones they have set for their philanthropy in the coming years. Our hope is that these stories will encourage fellow philanthropists to introspect on their own journey, take risks, create unique opportunities to make a difference and redefine traditional philanthropy.